This photo was taken on October 23, 2018 at 10:06 AM. The location was at one of the Homeless Shelters in Washington DC. The "Take It!" 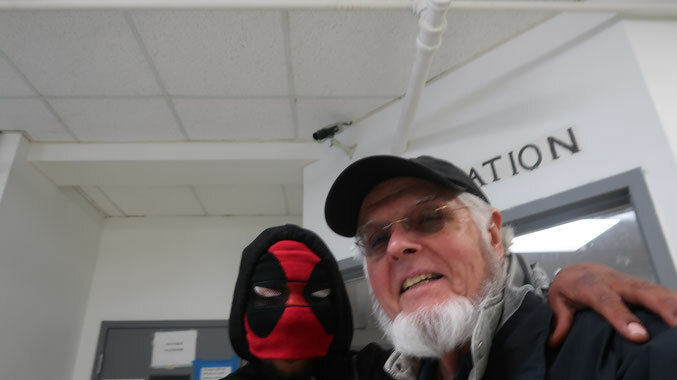 came after having given the homeless hats to this shelter for distribution I asked the resident on Host Duty who accepted the contribution if I could have a photograph with him. He was most gracious and profuse in his thank for my contribution of hats and scarves which I had delivered in a rolling suitcase which I had found next the the trash at a house nearby my own in my distant neighborhood. I had picked up the suitcase knowing I would deliver the hats using it as had witnessed the empty out of the shelter at a time before noon where by the temporary residents must depart, taking all their posession's and not return until the late afternoon. This gives the staff time to clean the facilities and make ready for their return. I had seen a number individuals in morning departures be facilitated using rolling suitcases which were certainly more convenient than multiple shopping bags which were used by others. After accepting my request to take a selfie with me - he shook my hand and again gave thanks for the donation. It was then, that he asked if he could have the suitcase and it was revealed that there was a good chance he too was one of the homeless residents that just happened to be on reception desk duty when I arrived. I quickly told him it was his to take and wished him my very best. This is the end of my part of the story of most of the collected and cleaned hats from last season. I kept a few that were really cool and will wear them for variety sake when it gets colder. We had a cold snap recently - and with it came the first hat catch from the street. It has already been washed and thus the count for the seasonal catch has started. While this has become a way of giving back for me - it has a way of sticking with me all year long. Being kind to the less fortunate among us - is best practiced at all times. PS: The beard I have grown is at what is to be its maximum length. The realization it was time to give it a trim came when someone asked me if I was going to apply for one of the Santa jobs next month - lol. I advised him - I was lucky enough to have another job - lol. Our oldest son informed me that is a Deadpool mask, not Spider-Man. News to me, I know nothing about the super hero genre. Hopefully he didn't wear that into his bank. I could see that causing an issue lol. That's Deadpool, pretty funny movies too. That's really a great thing you do! I dosomething similar with blankets and it's always so great to see the faces when they receive one. Awww what a sweet gesture. Reading things like this make me feel better about the world. If more people did kind acts like this, the world would be a better place. My husband and I donate and volunteer at a local shelter working in the kitchen. You may never get to see the people you help by doing things like this but let me tell you it does not go unnoticed. We have been working in the kitchen before when a new bag of clothing came in and its almost like Christmas morning. Their faces light up, they run to go get cleaned up before putting on fresh new clothes and I have often heard them discussing how they wish they could at least thank the donor. Keep up the good work, it matters very much to someone!